The Tour de l’Avenir, the most prestigious stage race on the U23 scene, starts today, and one of the riders who are hoping to shine in France is Dylan Teuns. The 22-year-old Belgian cyclist of BMC Development has had a strong season so far, with stage wins in the Tour de Bretagne and Giro della Valle d’Aosta, and podiums in other important races, such as Liège–Bastogne–Liège and Omloop Het Nieuwsblad. His potential didn’t go unnoticed and so the BMC Racing Team offered him a multi-year contract from next season. After the 2.HC Tour of Utah – another race in which Dylan Teuns had a solid ride, winning the best young rider jersey – I caught up with him and asked him a couple of questions about his season and future plans. – Dylan, in the first part of the year you had many strong results, including some wins. Which was the most important and why? I think the most important one is my victory in Tour de Bretagne, because it was the third time I raced there and I had seen that the guys who did well in Bretagne – Riccardo Zoidl, Julian Alaphilippe, Reinardt Janse Van Rensburg – went pro the next season. The only regret I have is my second place in Liège–Bastogne–Liège, where I made the mistake of thinking that I had won and didn’t expect anyone to pass me, but that is racing. – How important was BMC Development for your development? I learned a lot from Rik Verbrugghe, his experience in race tactics and riding a final helped me a lot. – A couple of weeks ago, you raced the Tour of Utah. How was it? It was an amazing experience, it was my first race with the BMC Pro Team as a stagiaire and my first on another continent. I arrived in Utah one week before the race to meet up with the team and all went very well. Utah is very beautiful and the sceneries are breathtaking, I liked it a lot. To be the best young rider and end up in 18th place in such a race gave me huge confidence for next season. – Now you’re going to L’Avenir. What do you think of the parcours? It’s the third time I will race the Tour de l’Avenir and the parcours is always relatively flat in the beginning and builds up for the climbs on the last days of the race. I like the last stages more than the first ones. I always have the feeling that I become better at the end of a stage race. – And what are your expectations? I always try not to have too much expectations. Of course, I’d like to win a stage, but there is only one rider who can be first. My goals are to be at a good level on the final climbs and to be in a good position in oder to fight for a stage win. A top 10 in the GC would be a good result. 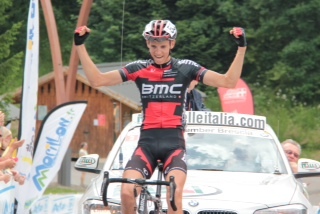 – Next year you’ll turn pro with BMC. How important is this for your career? This is the most important step of my career, there is no other step up, and to start my career with a World Tour team like BMC is a dream come true. But I have still a lot to learn and I am really happy that BMC has given me the chance to grow and to become a pro cyclist. – Ok, one more thing: please tell me three races you dream of winning in the years to come. A stage in the Tour the France, the World Championships, and Liège–Bastogne–Liège.